Ano Diakoftis, maisonette 92sq.m with very good taste, construction 2009, belongs to one of the most tasteful complexes of Mykonos. 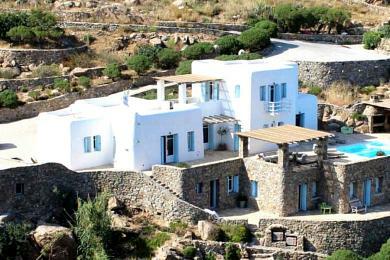 Its unique position offers a fantastic view to Mykonos Town and its Port so full of life. The lights of Mykonos Town and the illuminated ships are reflected in the sea and throws a spell over the unique Mykonian scenery. All the rooms and the verandahs have this fantastic view. The first floor consists of 1 bedroom, a bathroom and verandah. 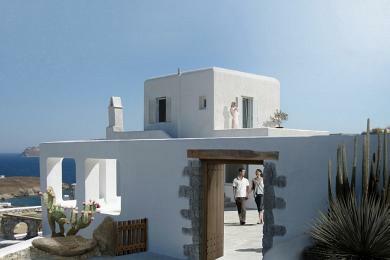 The second floor consists of 1 bedroom, a bathroom and traditional wooden balcony. Outdoor space with panoramic, unobstructed view to the sea.